Frank Schmalleger, Ph.D., is professor emeritus at the University of North Carolina at Pembroke, where he is also recognized as Distinguished Professor. Dr. Schmalleger holds degrees from the University of Notre Dame and The Ohio State University, having earned both a master’s (1970) and a doctorate in sociology (1974) from The Ohio State University with a special emphasis in criminology. From 1976 to 1994, he taught criminal justice courses at the University of North Carolina at Pembroke. For the last 16 of those years, he chaired the university’s Department of Sociology, Social Work, and Criminal Justice. As an adjunct professor with Webster University in St. Louis, Missouri, Schmalleger helped develop the university’s graduate program in security administration and loss prevention. He taught courses in that curriculum for more than a decade. Schmalleger also taught in the New School for Social Research’s online graduate program, helping build the world’s first electronic classrooms in support of distance learning through computer telecommunications. An avid Web user and site builder, Schmalleger is also the creator of award-winning websites. 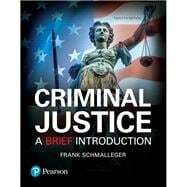 Frank Schmalleger is the author of numerous articles and many books, including the widely used Criminal Justice Today: An Introductory Text for the 21st Century (Pearson, 2017), now in its 14th edition; Juvenile Delinquency (with Clemens Bartollas; Pearson, 2017); Criminal Justice: A Brief Introduction, 12th edition (Pearson, 2017); Criminal Law Today, 6th edition (with Daniel Hall and John Dolatowski; Pearson, 2017); Crime and the Justice System in America: An Encyclopedia (Greenwood Publishing Group, 1997); Trial of the Century: People of the State of California vs. Orenthal James Simpson (Prentice Hall, 1996); Career Paths: A Guide to Jobs in Federal Law Enforcement (Regents/Prentice Hall, 1994); Computers in Criminal Justice (Wyndham Hall Press, 1991); Criminal Justice Ethics (Greenwood Press, 1991); Finding Criminal Justice in the Library (Wyndham Hall Press, 1991); Ethics in Criminal Justice (Wyndham Hall Press, 1990); A History of Corrections (Foundations Press of Notre Dame, 1983); and The Social Basis of Criminal Justice (University Press of America, 1981). Schmalleger is also founding editor of the journal Criminal Justice Studies (formerly The Justice Professional). 1. What Is Criminal Justice? I love eCampus they have a variety of options from renting to buying a new or used copy, the customer service is very helpful and I always find the right book! It really makes it easy for me! Criminal Justice A Brief Introduction: 5 out of 5 stars based on 1 user reviews.